Good morning everyone! It's Brittni from papernstitch, and today I am sharing some bite-size diy projects that I think you're going to love... Up first, is this simple woven bracelet tutorial from Honestly WTF, that mixes hard and soft with a pre-made curb link bracelet and some embroidery floss. Mix and match the floss colors to change the overall vibe. 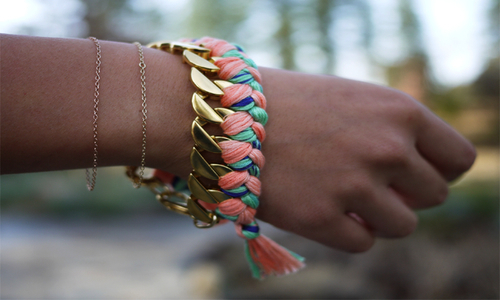 Get the scoop on how to make your own woven chain bracelet here. Crochet rocks will never go out of style in my mind. If you are nodding your head right now in agreement, you should try this urchin crochet covered rock tutorial from The Purl Bee. You can find the full tutorial right here. And since I am already on the subject of nature, I thought I'd mention this fabric flora project that you can use for tons of upcoming projects you've been meaning to start. 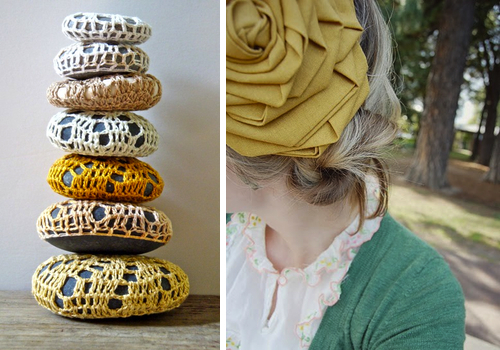 Add these large rosettes to pillows, create bold hair accessories, and more. Get the step-by-setp here on Trey and Lucy. The last project of the week makes me want to throw a party. The colors in these pom poms from Smile and Wave are party perfect. 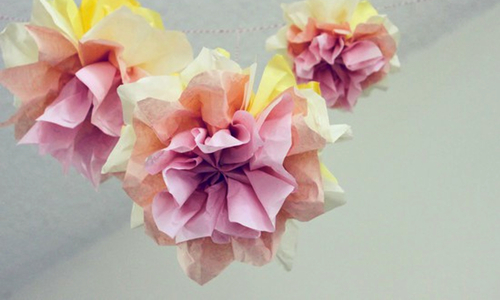 And you can make your own with some tissue paper and string. Get the full tutorial here. Well, that will do it for me this week. Thanks for joining me for another diy roundup. About Brittni: She is the founder of the handmade exhibition site, papernstitch and is also the editor of a handmade blog, by the same name. When not working on papernstitch, she is dreaming up fun little tutorials and crafting projects for her home. If you love DIY as much as Brittni does, visit her free diy projects and tutorials section for more than fifty quick and easy projects. I love this feature so much. I have been reading your blog for a while and never commented and now I'm glad I have hers too. I love the DIY with Brittni! I love DIY projects and look forward to these Friday posts. Thanks for adding them! Gonna make me one of those! Thanks so much Aimee. Super glad to hear you are enjoying my posts here on Oh Hello Friend. I am happy to be here to share my favorites each week. LOVE the pom poms! I need to try this!